What was originally announced as a one off performance has now become a full blown North American tour! KAMELOT are pleased to announce the second North American Leg of "The Shadow Tour". Dates begin September 10th in Silver Spring, MD and run through October 12th in Tampa Bay, FL. 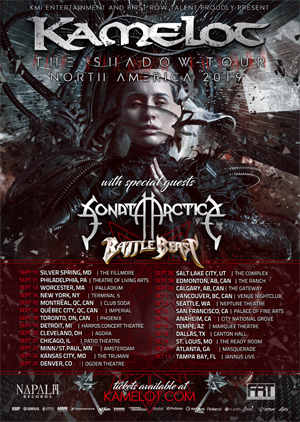 Support on the tour will come from SONATA ARCTICA and BATTLE BEAST. A complete list of dates can be found below. Exclusive pre-sale tickets are available now at www.enterthevault.com. "We're very excited to announce we're bringing "The Shadow Tour" back to North America again for another round. On the previous tour we missed some of our favorite cities due to logistics, we demanded to return to North America as soon as possible and visit these great cities, adds Guitarist Thomas Youngblood. Completing this amazing lineup is the addition of Finland's SONATA ARCTICA and BATTLE BEAST. Don't miss this amazing package and once in a decade lineup." KAMELOT are touring in support of their latest album, The Shadow Theory, which is out NOW via Napalm Records. Get your copy of The Shadow Theory HERE. The band's latest music video for the song "MindFall Remedy" chronicles live footage taken from KAMELOT's North American tour and offers just a glimpse of what you can expect when the band takes the stage. The video can be seen on KNAC.COM HERE. The Shadow Theory was produced by acclaimed music producer Sascha Paeth and mastered by Jacob Hansen. Guests on the album include Lauren Hart (ONCE HUMAN), Jennifer Haben (BETOND THE BLACK) and Sascha Paeth. The amazing cover and artwork was created by Stefan Heilemann.